Misty Copeland, the African-American ballet dancer who rose from poverty and learned the art at the untypically late age of 13, was named Tuesday as the first female black principal dancer of the American Ballet Theater in its 75-year history. Ahead of the official announcement, Copeland remarked at a cocktail reception June 24 on her opening night as the lead in ABT's "Swan Lake," that she "never dreamed" she would become a principal dancer. 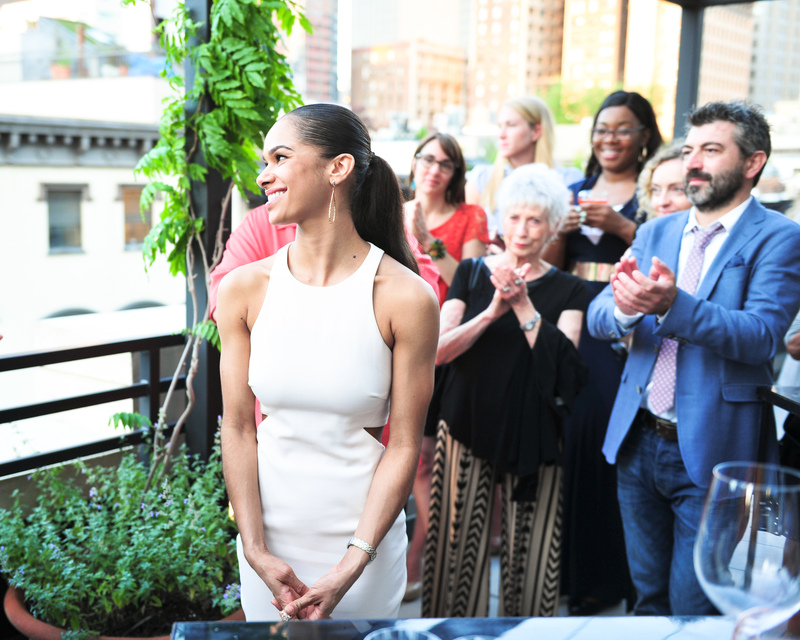 With tears in her eyes and surrounded by friends and family at the Smyth, a Thompson Hotel in Tribecca, Copeland delivered a short speech of thanks for the support, saying "I never ever dreamed of being a principal dancer, that's just not something I ever envisioned as a black woman. It's just really a humbling moment for me and for ballet." When the official announcement was made on Tuesday, Copeland was at rehearsal and was overcome with emotion in a reaction video she posted on her Instagram feed @mistyonpointe. Her promotion to principal dancer comes after a 14 year-career at the company, eight of which as a soloist. Following her stint as prima in "Swan Lake," Copeland will dance in "Cinderella," in July she told CBS News, and then go on vacation with her longtime boyfriend, Olu Evans. In the last few years, Copeland, 32, has become an icon of perseverance and empowerment, speaking and writing openly about race in America and embracing her role as a positive example for underprivileged youth. She was the subject of Bill Whitaker's "60 Minutes" feature this May, was on the cover of Time as one of the most influential people of 2015, and is the co-author of two books including the autobiography "Life In Motion: An Unlikely Ballerina," and a children's book called "Firebird," both released in 2014. Copeland, who had lived for most of her childhood in a motel in Missouri with her mother and brother, said she took her first ballet class in an outdoor basketball court. Her teacher, Cindy Bradley, recognized her ability one day while she was dancing in gym class, and then took her in to her home in San Pedro where she lived and learned for three years. "Once I was a part of it, I couldn't get enough of it," Copeland said in her "60 Minutes" interview. "So, every day I came into the ballet studio, it was like, 'Oh my gosh, I'm going to learn something new today. What is it going to be?' And just soaking it all up. I just never experienced anything like that."